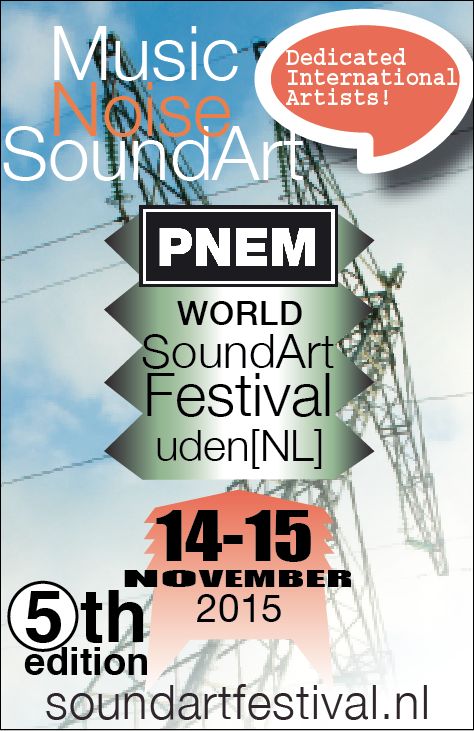 PNEM – SoundArt Festival Uden, Netherlands 14-15th November. On Saturday 14 and Sunday 15 November 2015, the platform new experimental music the fifth international Pnem Sound Art Festival 2015 with live, video and audio performances by artists from home and abroad. The Pnem Sound Art Festival offers a stage for musicians and artists that are located on the cutting edge of sound, music and new media. The organisers hope through the festival an international platform for the development and implementation of new experimental music and graphic art. To the public is also an active and participatory role. How’s your food? Take a walk in the woods with as a guide by yourself a soundscape selected or listen to the music via the app. In the context of 10 years klankenbos (be) and 5 YEARS PNEM FESTIVAL (NL) created a soundartist Bart Van Dongen in cooperation with app-Developer Yvan van der sanden an interactive GPS composition for two locations, the looppiste in Lubbock and The old velodrome of Belgian refugees in uden. The listen app gets a permanent nature, in Belgium as part of the world war I and in the Netherlands klankroute a luisterwandeling by the maashorst.